Thirty women peace makers from 15 countries made a historic crossing of the two-mile wide De-Militarized Zone (DMZ) from North to South Korea on May 24th International Women’s Day for Peace and Disarmament. We called global attention to the need for a peace treaty to finally end the Korean War; to reunite families long separated by Korea’s division; and to assure women’s participation in the peace process. 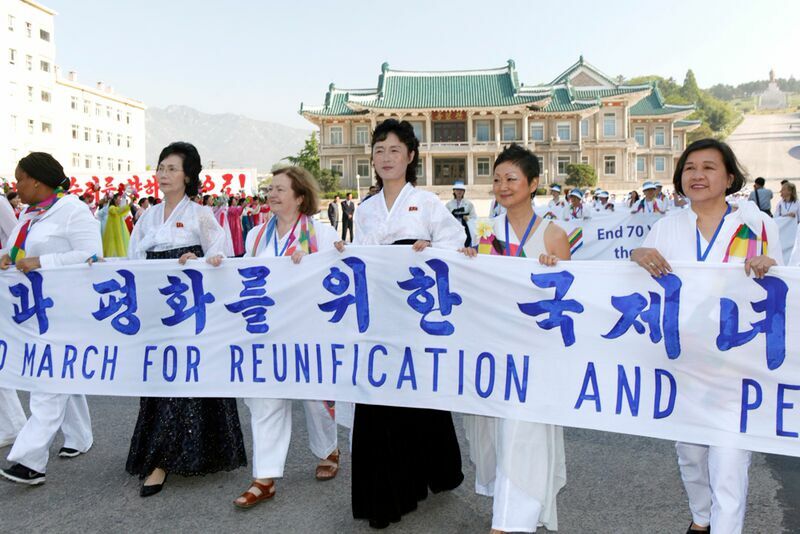 Because most citizens of North and South Korea are not allowed to cross the DMZ, international women crossed the DMZ on their behalf in solidarity with Korean women’s desires for peace and reunification of Korea. During the four-day visit to North Korea ahead of the May 24th DMZ crossing, we connected with North Korean women, learning about their experiences of war and division, and sharing how we mobilize women to end conflict in our communities. Parallel events were organized with women of both Koreas, culminating in peace symposiums, one in Pyongyang and one in Seoul, and peace walks in Pyongyang, Kaesong, and Paju – all with thousands of Korean women. 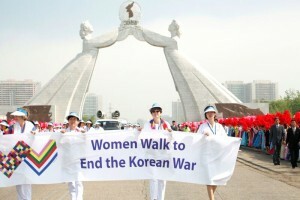 The 2015 Women’s Peace Walk succeeded in bringing global attention to the unended, “forgotten” Korean War. By physically crossing the DMZ—the militarized division that was created as a direct result of the 62 year-old ceasefire—the Peace Walk generated major global media attention and an outpouring of support from world leaders, including eight Nobel Peace Laureates, U.N. Secretary General Ban Ki-Moon, U.S. President Jimmy Carter, Archbishop Desmond Tutu, the Dalai Lama, authors Alice Walker and Naomi Klein, actor Robert Redford, Arun Gandhi, Cardinal Andrew Yeom Soo Jung, physician Deepak Chopra, co-founder of Twitter Evan Williams, U.S. Governor Bill Richardson, and Jack Rendler of Amnesty International USA. Leading women’s rights organizations supported us, including Nobel Women’s Initiative, Global Fund for Women, AWID, MADRE, Urgent Action Fund, and Women Peacemaker Program, which started International Women’s Day for Peace and Disarmament twenty years ago. Dozens of South Korean women Parliamentarians across political lines issued a public statement endorsing our walk. And hundreds of individuals provided financial support to make our historic journey possible. We are so incredibly grateful for this community’s leadership and partnership. Inspired by the long history of Korean women peacemakers, we helped revive Korea’s peace and reunification movements, which have been deflated since the souring of inter-Korean relations. Since 2007, their efforts to engage with North Koreans have been greatly hampered, and even criminalized. According to our South Korean partners, the solidarity of international women peacemakers helped renew debate and open political space in South Korea, including putting into public discourse the legal mandate of UN Security Council Resolution 1325, which ensures the female half of the world be involved at all levels of every peace process. The deadlocked situation on the Korean peninsula calls for game changer initiatives like Women Cross DMZ that go beyond conventional paths. As a group of people generally outside structures of power, women peacemakers offer a critical perspective in the analysis of conflict, providing strategies toward peacebuilding that focus on creating ties across opposing sides. As Korean feminists have taught us, the militarization of Korea leads to greater masculinization of society, which increases violence against women and strips resources away from social welfare and human security. In preparing for the Peace Walk, a diverse group of international women from a variety of backgrounds and political views came together, including artists, scholars, human rights defenders, and peace activists from the Asia Pacific, Africa, North America, Latin America, and Europe. We partnered with organizations in both North and South Korea. In North Korea, we established working relationships with the Korean Committee for Solidarity with World Peoples and the Democratic Women’s Union of Korea. In South Korea, we partnered with local women’s groups such as Gyeonggi Women’s Network, Korea Women’s Political Solidarity, and Iftopia, as well as several leading national women’s organizations, including Women Making Peace, YWCA of Korea, Korean Women’s Association United, and Korean Council for the Women Drafted for Military Sexual Slavery by Japan. We are enormously grateful for their leadership and partnership, without which the Women’s Peace Walk could not have happened. Through a collaborative process with both North and South Korean women, we issued the Declaration of the 2015 International Women’s Walk for Peace & Reunification of Korea. 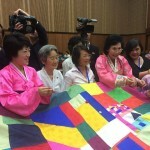 At the end of our symposium in Pyongyang, through laughter, tears and song, we also stitched together a jogakbo, a traditional Korean quilt, with parts made by North and South Korean, diaspora, and international women, signifying the role that each group must play to help reunify the Korean peninsula. Our walk brought renewed attention to the importance of world solidarity in ending the Korean conflict, particularly since the 1953 Armistice Agreement was signed by North Korea, China, and the United States on behalf of the UN Command that included sixteen countries. It helped highlight the responsibility of the international community—whose governments were complicit in the division of Korea seventy years ago— to support Korea’s peaceful reconciliation and reunification. Lastly, we believe that knowledge and connection lead to meaningful dialogue. To that end, we leveraged technology as a medium for empathy, exposure, and education by using a video streaming application called Periscope. We broadcast live footage via social media such as Twitter from both North and South Korea. This was the first time in history that moments both formal and casual were shared live with the world in such a manner from North Korea. By providing intimate glimpses from the inside, we transported the world into an otherwise inaccessible place and culture, helping to transform the unknown into the familiar. The challenges of overcoming Korea’s division became apparent in the complex negotiations over our DMZ crossing between North and South Korea, as well as with the UN Command, which has formal jurisdiction over the DMZ. Although we hoped to cross at Panmunjom, the “Truce Village” where the armistice was signed, we decided after South Korea and the UN Command denied our crossing there that we would take the route agreed by all parties in the spirit of compromise lest our actions further strain the already tense North-South relationship. The challenges of overcoming division were further illuminated by the misrepresentation of our delegation’s comments made in North Korea. We registered complaints to our hosts, insisting that our comments not be misrepresented and used out of context. Instead, these misquotes were further distorted by some South Korean and international news outlets. We did not meet with any heads of state or endorse any political or economic system, maintaining a neutral stance throughout, and yet, it was apparent that divisions within South Korea itself manifested in some of the ideologically divided reception and reactions that we witnessed. Our Women’s Peace Walk has initiated discussion, at times heated, on the best policies and strategies for advancing peace and reconciliation in Korea. This is healthy and we are glad to generate such debate, but as we engage in respectful dialogue, we expect the same of those who oppose our position. Our efforts to end the Korean War and press for family reunification and the participation of women in peacemaking are a true expression of our fundamental human rights to peaceful assembly, to freedom of expression, and to defend the right to peace. The Women’s Peace Walk will be a “long” walk. The 2015 DMZ crossing is not the end, but the continuation of a long-term movement for peace and reconciliation of Korea. We bring an alternative civilian voice from an international feminist perspective to challenge over 60 years of military standoff. It is the first step in highlighting the significance and urgency of peace in Korea to strengthen our support of Korean women to help bridge the two sides. This is our first meeting with women of North and South Korea as an organized international body, and the beginning of relationships that we hope will foster deeper conversations about the impact of militarism on the North and South, including issues of human rights and nuclear disarmament. Peace is a necessary condition for the full realization of human rights. States of hostility and international conflict are the basis on which states have long violated the rights of their citizens. Article 28 of the Universal Declaration of Human Rights states that all have a right to an international order that permits the fulfillment of all rights enumerated in the Declaration. The continued state of war between the two Koreas is a major obstacle to such an order and a rationale for the violation of human rights. Human rights and peace are integral one to the other. Neither is more important than the other; they proceed together. As we look around the world, including our own​ ​countries, we also see that the closer a country is to a war footing the less it respects human rights values. Our focus is to increase civilian exchanges and women’s leadership, highlighting the obligation of all parties involved to decrease militarization and move towards a peace treaty. We therefore urge increased engagement at every level — civilian, economic, cultural, academic, governmental. The alternative is heightened risk of full military conflict, which is not an option. Twenty countries fought in the Korean War, and thus, in many ways, it was – and continues to be – a global conflict. The absence of a peace treaty and the ongoing militarization of North and South Korea and other countries in northeast Asia are global threats. The international community and the UN which took part in the Korean War have a responsibility to close this tragic chapter in Cold War history. Thus, we will continue our efforts until a peace settlement is achieved in Korea for peace in northeast Asia and our world.